Get your guitar sound another rung up the ladder with an effect that is bold and a bit on the psychedelic side. Rocktron’s Reaction Series pedals are built into a rugged metal slim form factor chassis, taking up as little space as possible on your pedalboard. 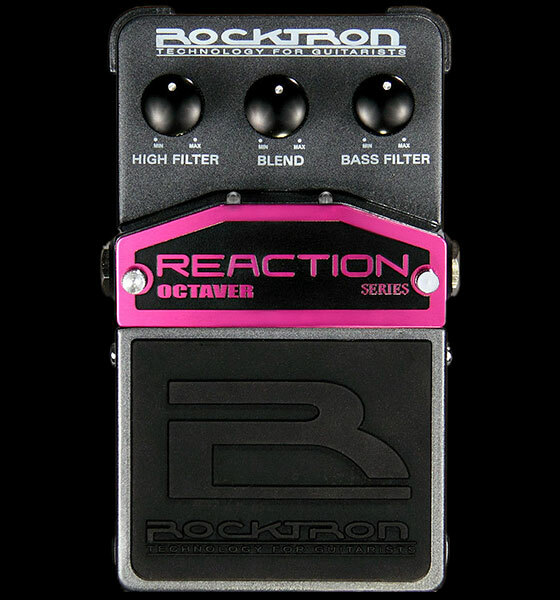 The Reaction Octaver is a TRUE BYPASS pedal: when you turn it off…it is out of your signal path! Controls include BLEND which controls the Mix between the original input and the Low Octave effect. HIGH FILTER controls the overall Treble content of the effect. BASS FILTER controls the overall Bass content of the effect. If you’re looking for that low down gritty Octave effect, you’ll love the Reaction Octaver. Experimenting with the HIGH FILTER, LOW FILTER and BLEND controls to find anything between an octave down effect to a quasi ring modulator effect is crazy fun…and true bypass too! The footswitch on the Reaction Octaver controls On/Off status as shown by the LED indicator. Reaction stomp boxes run on a 9V Alkaline battery, or may also be powered by Rocktron’s DC OnTap Universal Power Supply adaptor.